When 76-year old Bob who lives in Woodinville, WA was diagnosed with Parkinson’s Disease in March of 2016, one of the first things his doctor said to him was that exercise was the best way to slow the progression. Bob, no stranger to the power of exercise, started distance running when he turned 40 and ran five marathons from 1982 – 1986 (four in New York City and one in Boston). He’s always been health conscious and dove into the research about exercising with Parkinson’s disease and the benefits of using an exercise bike for Parkinson’s disease, as well as other Parkinson’s disease-related exercise equipment and approaches to stay active and a lead healthy life. Similar in quality to higher-end exercise equipment like SciFit, Biodex, Theracycle, and more, the portable Excy cycling system offers a full body workout, but integrates thousands of dollars of equipment into a small portable footprint. This includes capabilities of a gym quality recumbent exercise bike, upper body ergometer, and full-body resistance trainer. The difference is, ours is portable and rugged for indoor and outdoor workouts anywhere. 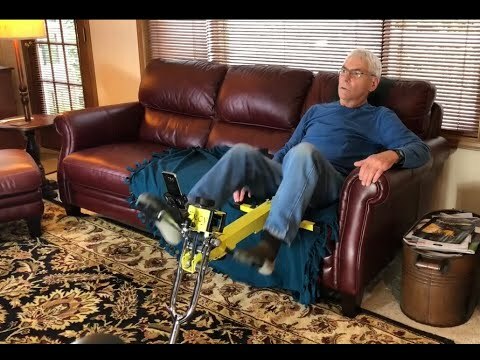 Bob has been using Excy primarily as a recumbent exercise bike 4-days a week for almost a year to fight the challenges of Parkinson’s disease like decreased mobility, flexibility and loss of balance. Using Excy as a recumbent exercise bike from the couch fully embraces Excy’s patented approach that eliminates the “scooting away” challenges of other portable exercise bikes through what we call the Excy Keeper. The Excy Keeper is a flexible durable material made of vinyl and coated fabric used to establish a strong connection between the rider and the Excy cycling system to keep it stationary and prevent it from scooting. It’s super easy to set up and rolls up tightly to carry in a purse or laptop bag or place in a kitchen drawer. For Bob, he simply lays the Keeper over the back of his couch, attaches the Excy system and easily converts his comfortable couch into a powerful recumbent exercise bike. The flexibility that Excy offers to turn any couch into a recumbent exercise bike is unmatched in quality, which is the primary position that Bob uses Excy when he finds that his legs are hurting. 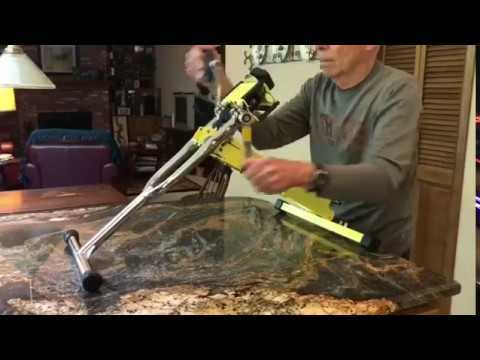 Bob also uses Excy as a full-body exercise bike at home workout by pedaling Excy as an upper body ergometer to build and maintain upper body strength. Bob also does Yoga once a week with his wife and just started boxing twice a week as part of his Parkinson’s disease treatment. 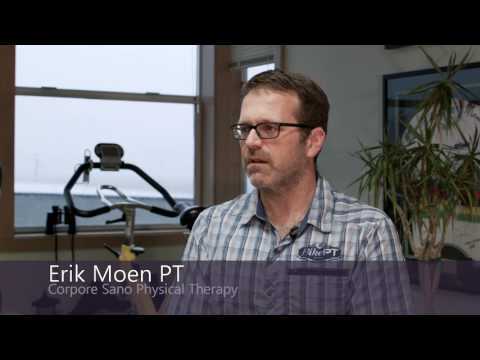 As doctors, physical therapists, and researchers continue to uncover the benefits of Parkinson’s disease exercise, our goal is to make it as easy as possible to help connect exercise to everyday life for anyone. So, we are beyond excited to see Bob squeezing in frequent rides at home, work, or on the go! As we wrote in our blog post about the inspiration of the Excy Family, no one wants their injury or a diagnosis to define them or hold them back from doing the things they love. Excy is always ready at the exact time and place that people have to exercise! If you know someone suffering from Parkinson’s disease and they want the benefits of a quality system, invite them to explore Excy. They are welcome to use the code PARKINSONS at checkout to save $50 off their purchase price.